Thornapple River House shown shortly after completion. Notice the brick wall that runs through the center of the house providing a strong horizontal orientation. 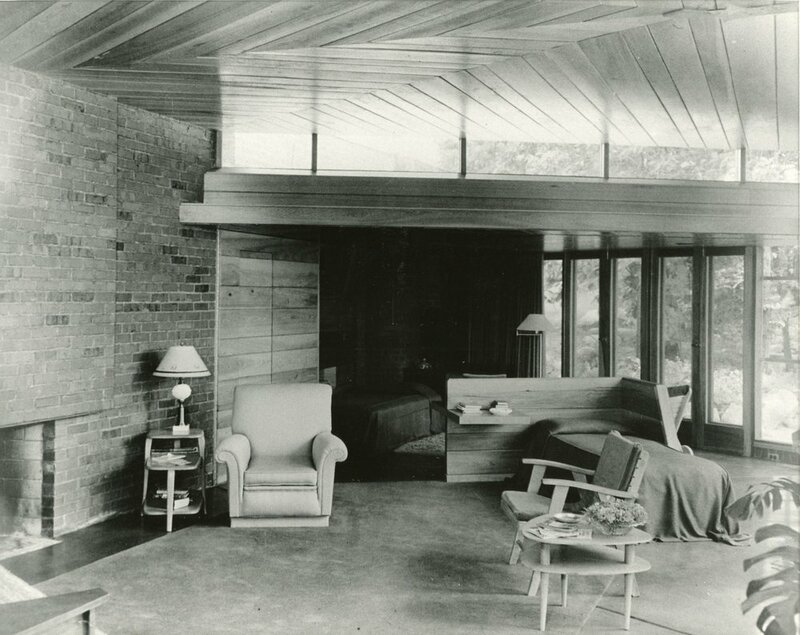 THORNAPPLE RIVER HOUSE, A USONIAN HOUSE DESIGNED AND BUILT BY HAROLD TURNER. Story by Pam VanderPloeg, copyright 2017. The Thornapple River House, completed 1947-48, is located on a street named Valhalla in the little community of Alaska, southeast of Grand Rapids. The summer house was designed and built by Harold Turner in the Usonian style for his wife’s relatives, Edna and Edward Hargrave. The Hargraves lived in what is now the Heritage Hill district in Grand Rapids, and owned the Mug and Muffin restaurant at 75 Division Street in the downtown area. They had purchased 11 acres with 600 feet of frontage on the Thornapple River to enjoy as they approached retirement. They hired Turner, a former master builder for Frank Lloyd Wright. Turner supervised construction of Usonian houses, includingthe Hanna, Goetsch-Winkler, Rebhuhn, Christie, Armstrong, Wall and Affleck Houses. In the 1940’s Turner lived in Bloomfield Hills, near Detroit. View from the outdoor patio at the edge of the steep cliff overlooking the river. Turner was a skilled cabinet maker, who had immigrated to the United States in the 1920’s and settled in San Jose, California according to the 1940 Census. Stanford University professor Paul Hanna knew that Frank Lloyd Wright was having trouble finding a builder willing to take on what would become the Hanna House. Hanna knew of Turner’s work and urged Wright to hire him. To that end, Wright invited Turner to Taliesin and he had a few weeks of orientation there before starting work on the Hanna house. Turner embraced, and later incorporated on his own farm, the Taliesin philosophy of farming and self-sustenance. Turner moved around the country building Usonian houses when the Hanna House was finished. When Wright and Turner parted ways, Turner began designing and building homes based on what he had learned from Wright and his own substantial knowledge of carpentry and construction. Turner also owned a popular Bloomfield Hills restaurant Devon Gables where the Hargraves also visited on a regular basis to take care of the bookkeeping. Turner was described by the Grand Rapids Herald as a modest man in his early 40’s or 50’s when he was working on the Thornapple River House. Frank Lloyd Wright advised clients to find a site that seems impossible to build on, and developed the hexagonal grid used in many of his Usonian homes that were built by Turner. The site used for the Thornapple River House would have been considered remote in the 1940’s and difficult anytime to build on. So Turner drew on his knowledge of the hexagonal grid to create the sharp angles to hug the steep and narrow curve of the Thornapple River. Door to hall and bathroom is hidden in the wall of cypress panelling. The house is like a large studio, placed on a steep bank at the river’s edge. Kitchen, dining, living and bedroom are one space with floor to ceiling windows facing the river. There is a separate hall leading to a bathroom, storage and utility space accessible from the main entry and also from the large living space via doors that blend into the cyprus panelling. The walls of the Thornapple River House are brick, glass and wood. The house has a large trapezoidal living area with three walls of glass one side of a thick brick wall that intersects the house, and emerges on the east end to anchor the house into it’s natural surroundings. The brick wall is a structural element that creates a strong horizontal line. The ceiling is made up of mitered cypress panels in a chevron designed that have mellowed to a warm finish. The light reflects off the ceiling and is mirrored on the floor of shiny polished red concrete - all original. Turner House in 2015 vacant and listed for sale. The floor to ceiling glass windows formerly were smaller windows with wood partitions and are now replaced with a grouping of vertical single pane windows across the front. The front and side entrance doors are glass piano hinged doors. Photograph by Pam VanderPloeg, copyright 2017. The nine-foot ceilings of the main living space contrast with the seven-foot ceilings of the kitchen end at the main entrance and the sleeping end at the opposite side entrance. Clerestory windows on both ends provide a view of sky and trees. The front and side entrances are glass piano hinged doors. Behind the fireplace grouping in the living room is the half-wall partition separating main area from bedroom. In Turner’s linear open plan, only movable partitions and screens separate the bedroom area from the living room. There is a built in chest of drawers and a wall inset designed to serve as a built-in night stand. The original kitchen is gone but originally held a Monet metal sink and oil-treated plywood counter. The appliances were recessed into the brick wall. The ceiling light was a light socket in a triangular recess. The foundation is a concrete slab over a bed of insulating stone/gravel using a radiant heating system. The roof with its extremely sharp angles, is easily accessed from the ground, and we climbed it to take in the view with the owner. Edna Hargrave shown enjoying her new house. The Hargraves enjoyed their comfortable house and its wonderful views of seasonally changing Thornapple River views for many years. Edward died in 1966 and Edna died in 1980, both in Bloomfield Hills. They chose to be buried in Grand Rapids closer to their beloved Thornapple River House, in the Woodlawn Cemetery where today you can still see their gravestone. The Thornapple River House by Harold Turner is a little known hidden gem in the history of Grand Rapids architecture and an important part of Harold Turner’s design repertoire, as it represents the great lessons he learned in his work for Frank Lloyd Wright. Frank Lloyd Wright’s Usonian Houses: Designs for Moderate Cost One-Family Homes by John Sergeant. Grand Rapids And Birmingham City Directories. “In the Nature of Materials” by Henry Russell Hitchcock, Architectural Forum, January, 1948. “Thornapple House is Way of Life,” by L.F. Jessup, Building Editor, Grand Rapids Herald, September 19, 1948. “A Space Craft,” by Karin Orr, Grand Rapids Press, date unknown. U.S. Social Security Death Index for Edna Hargrave, Edward Hargrave, Harold Turner. Frank Lloyd Wright in Michigan by Dale Northup, Algonac, Michigan: Reference Publications, 191, 2nd Revised Edition. Frank Lloyd Wright’s Hanna House: the Client’s Report by Paul Robert Hanna. New York: Architectural History Foundation, 1981.